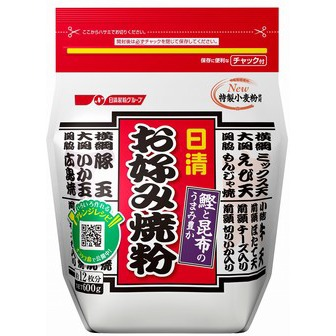 This flour is for OKONOMIYAKI. Directions; In a large bowl, whisk together 100g Okonomiyaki Flour, an egg and 120ml water until smooth. Mix cabbage, shrimp, and onion etc in it. Put oil in a fry pan, and heat it. Cook the OKONOMIYAKI mixture in flattenning like a pancake. Put sliced pork on it. Flip it over and cook it. Remove to a plate and drizzle mayonnaise and okonomi sauce. Ingredients; wheat, salt, sugar, powder of dried bonito,dried baby sardine and kelp, starch, baking powder and amino acid.